Pointer to array of integers: A pointer to such an array which contents are integer numbers is known as pointer to array of integer. array : It is array of size three and its content are address of integer. 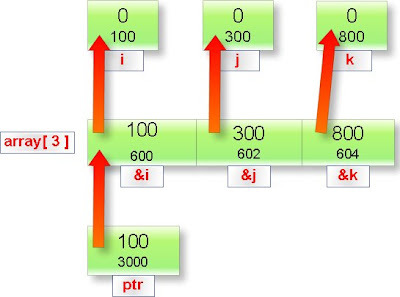 ptr: It is pointer to array which content are address of integer. Explanation: Address of auto variable cannot be member of an array. Explanation: Address of auto variable can be member of an array. bt previously we increment the (&i) with statement ++(**ptr)-thats means points next static int memory location so ans is 0 in first question.